This 9 month old Fresian bullock is one of a number in a group with corneal lesions ranging from corneal ulceration to fibrosis with granulation tissue. What is the condition and what are the factors involved in the genesis of the lesions? What treatment would you recommend and what prophylactic measures should be taken with the rest of the group? 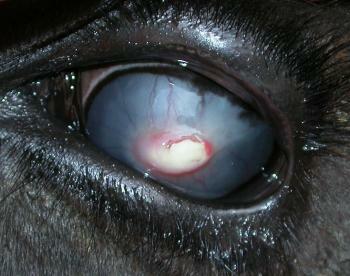 This is infectious bovine keratoconjunctivitis (also known as New Forest Eye), with a stromal abscess in this animal caused by Moraxella bovis. No fly control measures have been used on this animal and thus bacterial spread by flies has been substantial. Treatment using subconjunctival antiboiotic (long acting amoxycillin or tetracycline) will improve the condition but long-term corneal scarring is likely in such a case. Fly control measures such as repellant ear tags, or moving the cattle away from fields next to wooded areas, are important in reducing the disease. This entry was posted in Cases and tagged Food Animal, Infectious bovine keratoconjunctivitis. Bookmark the permalink.